Union midfielder Derrick Jones runs after the soccer ball against Eintracht Frankfurt during a international friendly on Saturday, July 14, 2018 in Chester, Pa. Since the MLS season began, the Union have played 21 competitive matches — 19 regular-season games and two U.S. Open Cup contests. If you do the math, that's just about 31.5 hours of game time. Derrick Jones has seen the field for just 120 total minutes. In the Union's friendly with Bundesliga side Eintracht Frankfurt, the Philadelphia native showed coach Jim Curtin he might deserve more playing time in the season's second half. 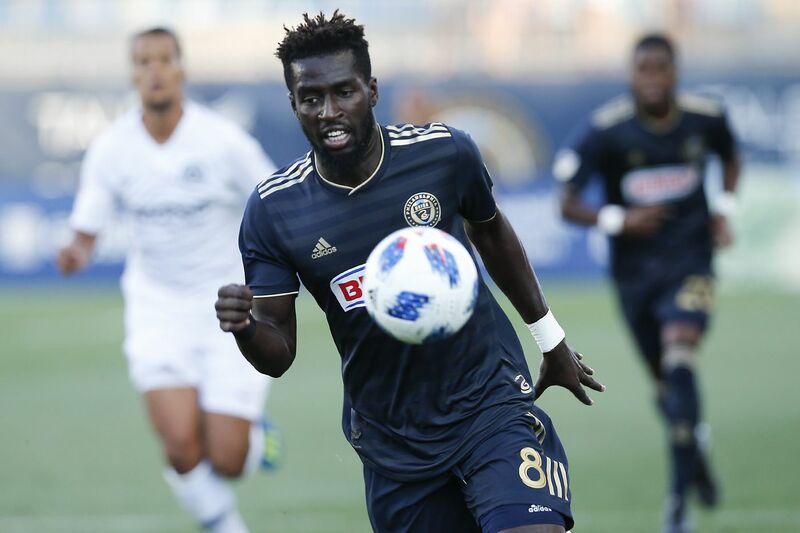 Jones scored the lone goal in the Union's 1-0 victory at Talen Energy Stadium on Saturday night, capitalizing on a Frankfurt turnover in the 49th minute when he slid into the side netting for his second-ever score in a Union jersey. "Jim just told us to press the last 15 minutes," Jones said. "We went out there to step forward and press, try and get a goal." Jones was part of the 10 Union players who started the friendly and played the first 59 minutes before coming off as Curtin and his staff had planned before the game. The goal was a positive for Jones, 21, yet Curtin desired even more from the team's homegrown product at times. "In the first half, Frankfurt did a good job pressing us in the middle of the field. There were a couple of moments where Derrick could've angled his body so he could've played one or two touches to get out of a tight spot," Curtin said. "He did a good job for us, broke up some plays. Physicality is never a question with Derrick — it's just changing speed [and] doing it with intensity." The Union have a crowd at the holding midfielder spot. Haris Medujanin is the unquestioned regular, and Warren Creavalle, who started alongside Jones on Saturday, is the backup. Despite making eight MLS starts last season and 12 total appearances, Jones has played double-digit minutes only once this season, and Saturday was his first start for the Union in more than a year. In the meantime, Jones has played 13 games for the Bethlehem Steel, starting all of them and scoring four goals. His real goal, though, is playing in the MLS on a more regular basis. "For me, whenever I get the opportunity to go on the field, I just try to work hard and try to get back on the first team," Jones said. The Union will host Orlando City SC on Wednesday night in a U.S. Open Cup quarterfinal before Zlatan Ibrahimovic and the LA Galaxy come to Chester next weekend.